Before he coached at St. Francis Xavier, Don Loney played eight seasons in the CFL with the Toronto Argonauts, the Ottawa Rough Riders and the Calgary Stampeders, winning two Grey Cups, and also won the Jeff Russell Trophy in 1950 for being the Most Valuable Player of the East. 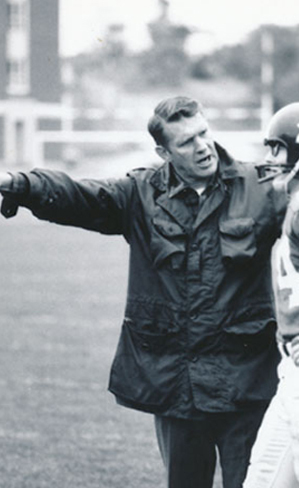 While at St. Francis Xavier, Loney was instrumental in the creation of the Atlantic Bowl in 1960, (Canada’s first post-season invitational game, which became a national semi-final). Further, Don was also active in the conception of the Canadian College Bowl, which is now called the Vanier Cup that crowns Canada’s national collegiate football champion. Don Loney is also a member of Canada’s Sports Hall of Fame.